So, I was thinking of doing a series on the “changing face” of various common aspects of the game, comparing how different versions do the same thing. For example, initiative. But it turns out someone else has just already done such a post, and they did it really well. This is a good thing! Less work for me to do. 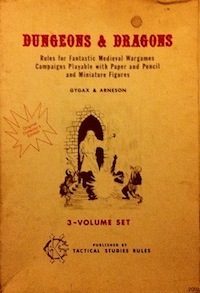 Monsters & Manuals also discusses. The original motivation was to familiarize myself with how earlier versions of the game did things, as when I played before, I mostly used a heavily house-ruled version of 2nd Edition. There are still probably many other fruitful topics for such a series; if I can accomplish the whole project by merely redirecting myself to content elsewhere on the Internet, all the better. This entry was posted in Uncategorized on October 3, 2011 by Necropraxis.